Saturday mornings in the southeast Colorado town of La Junta (population 7,000) are more active – and muddier – than they used to be. Each Saturday, regardless of the weather, 1971 Scholar Barry Shioshita and a group of friends gather at a variety of locations to train for obstacle racing. 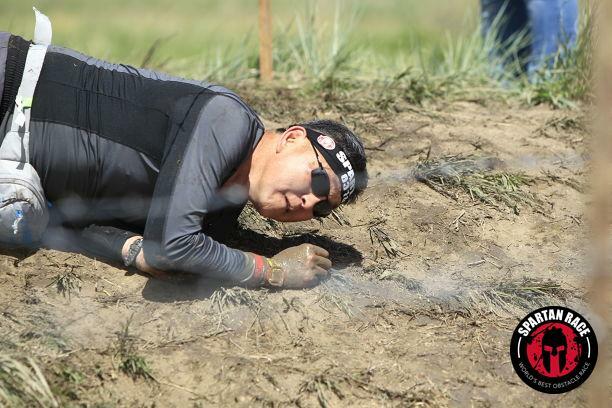 The core members, known as Team OGZR (“Old Geezer”), began meeting five years ago to train for Spartan mud runs after Barry, a fourth-degree black belt in Taekwondo, sought a new training regimen. However, not long after completing their first race, they realized the potential for a new mission: transforming a muddy arroyo into a channel for community wellness. As the CFO for Southeast Health Group, a nonprofit that provides behavioral and primary care health care, along with comprehensive wellness services across six counties in southeast Colorado, Barry was aware of the lack of community awareness and the stigma associated with those suffering from mental illness. He also knew that the arroyo bordering the Southeast Health Group building was the location of a long-planned trail. Inspired by these two needs, Barry, Team OGZR and employees of Southeast Health Group launched La Junta’s first-ever Mud Sport event in April 2013, in celebration of Children’s Mental Health Month. “The first mud run helped us to grow a concept, and develop the course route,” said Barry. Since then, the event has become a staple in La Junta each April, with nearly 250 runners enjoying muddy obstacles, music and a tour of Southeast Health’s integrated healthcare facilities. Recently, the city and Southeast Health Group developed a disc golf course adjacent to the trail, a permanent amenity that engages up to 50 people on sunny Saturdays, and is indicative of Southeast’s philosophy of healthy lifestyles. After attending Sierra Grande High School and receiving the Boettcher Scholarship, he studied business administration, economics and marketing at Adams State. Barry and his wife moved to La Junta where he began a three-decade career as a county administrator, overseeing the day-to-day operations of counties in Colorado and northern California. He returned to La Junta in 2011 to provide financial and strategic oversight for Southeast Health Group, the largest healthcare provider in southeastern Colorado. As a healthcare administrator in rural Colorado, Barry has a direct hand in responding to community needs and adapting to challenges. A few years ago, the community was faced with a drastic reduction in the number of primary care providers who were in the area. Southeast Health recognized an opportunity not only expand its market, but also provide an integrated approach to healthcare. Barry, staff and volunteers spent weekends and nights on the facility renovation, taking it from concept to opening in seven weeks. In response to changing needs, Southeast Health has also added a mental health peer advocate drop-in center, fitness equipment and the only hydrotherapy pool between Pueblo and Kansas. Barry is a strong believer that the integrated healthcare model of one-stop shopping for primary care, behavioral health and physical therapy works. For Barry, community isn’t just where he lives – it is how he lives. Community-building has shaped his profession and public service since winning the Boettcher Scholarship in 1971.